English: Figure on horseback, disproportionately larger than horse. Figure's head surrmounted by conical coiffure covered with blue pigment; lashes bulge out in relief; arrow- like nose; teeth exposed in open mouth. Series of incised "L" shaped lines at sides of face covering cheeks. Long neck, rounded shoulders, arms at sides bent at elbows. Garment on torso described by series of incised lines: 2 knives oriented horizontally at sides one on either hip. Horse: ears pointed upward at top of head; long face pointed at muzzle; round eyes in relief; striated tail at rear narrows at tip. CONDITION: Figure's arms broken off at level of forearm. Chips off beard P.R. side of face and at front. Piece missing from P.L. side of horses face appears sanded down. Series of parallel splits in wood running across horses neck and back. Light split through P.R. foot. Splits across surface of base. P.L. side, toward back of base: underside has been eaten away by extensive insect damage creating imbalance in figures support. Rectangular white sticker at back of neck (91A144/17). English: This figure has been attributed to the workshop of the renowned Yoruba carver Toibo, of the town of Erin. It was probably carved in the 1920s or 1930s for the timi (king) of Ede (one of the historic Yoruba kingdoms), who kept it in a shrine dedicated to the orisha (god) Shango. 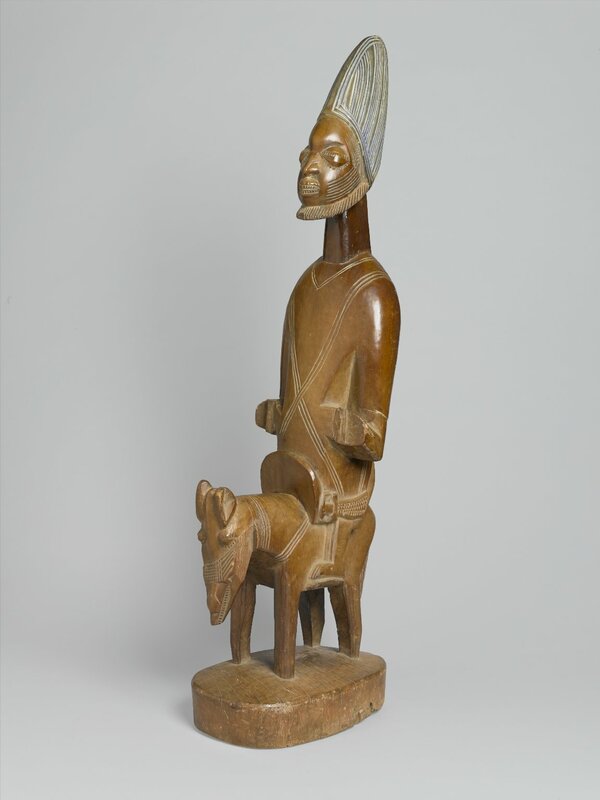 Equestrian figures are potent symbols of power in many parts of Africa where ownership of horses was long restricted to warriors and political leaders. In Yoruba mythology, Shango was both a king and the orisha associated with thunder and lightning. This file by Brooklyn Museum was uploaded as part of the Share Your Knowledge project developed within WikiAfrica.